Get to know the 39-year old musician Nick Carter, before he got famous (e.g. Backstreet Boys). IMDB reports The Greatest Music Party in the World (TV Special) was Nick Carter's first TV appearance in 1995. His home town is Jamestown, New York, U.S.. His parents Jane Elizabeth Schneck & Robert Gene Carter are of German, French, Irish, Canadian, Scottish, English, Welsh, ethnicity. 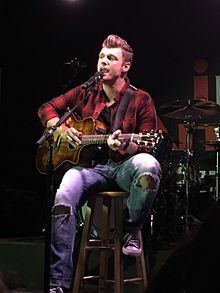 Nick Carter was born on January 28, 1980 on a Monday. Nick Carter released Backstreet Boys - We've Got It Goin' On, from the album Backstreet Boys in 1995. Old-school Nick Carter interview from November 1999. Share your real life experiences with Nick Carter here and rate your meeting! Correct our wiki/bio - is he not gay or straight or of different heritage? Let us know!